Satyanarayan Pooja Mahaprasad recipe step by step photos - Today I am here with a traditional mahaprasad recipe which is prepared during Satyanarayan pooja and Ganesh chaturthi festival. I have performed Satyanarayan pooja in shravan month. 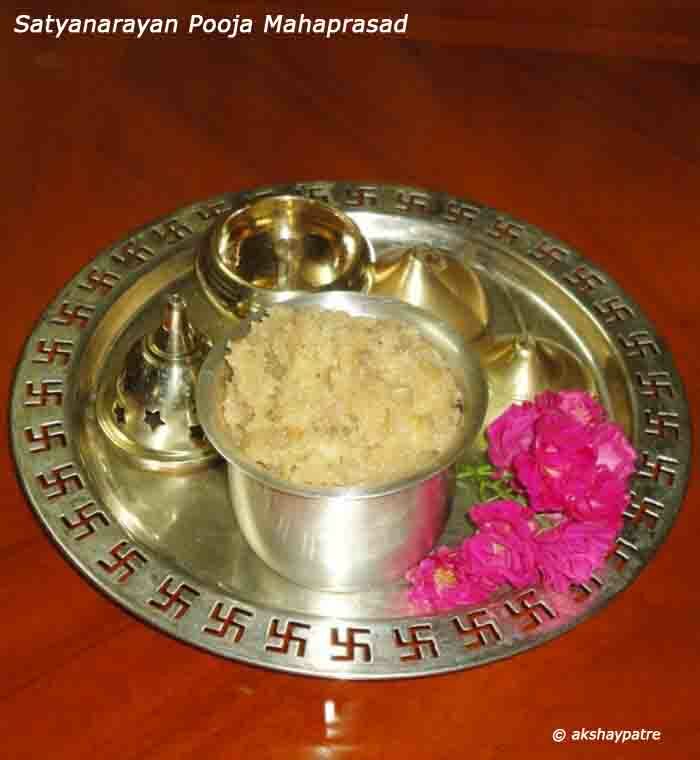 During this pooja, mahaprasad is offered as naivedya to Lord Satyanarayan. 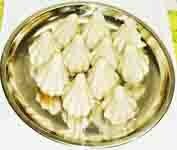 The same prasad is also prepared to offer Lord Ganesh during Ganesh chaturthi festival. 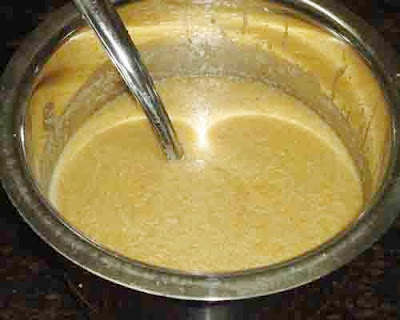 This is the traditional method of making prasad by using ghee, rava, sugar, banana, milk and cardamoms in proper proportion. 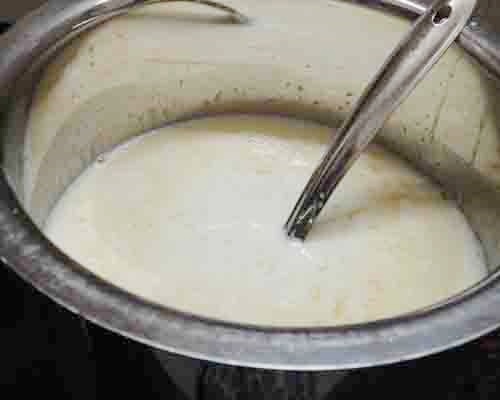 This is a very simple dish to prepare but need some patience as it requires continuous stirring. It tastes absolutely divine and is worth the effort. Read the full recipe to prepare popular mahaprasad in a traditional way to offer God during festival and pooja occasions. 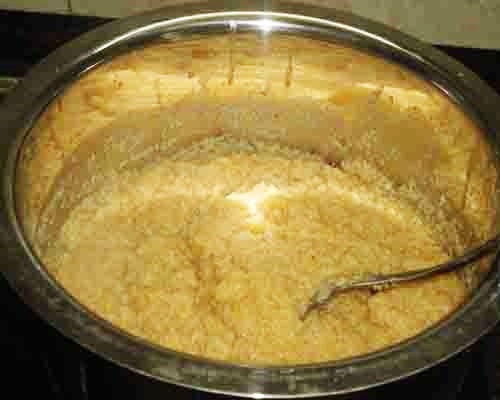 Mahaprasad for Satyanarayan Pooja prepared using ghee, rava, sugar, milk, banana and flavored with cardamom. Pour the ghee in a thick bottomed vessel and keep it on medium flame. 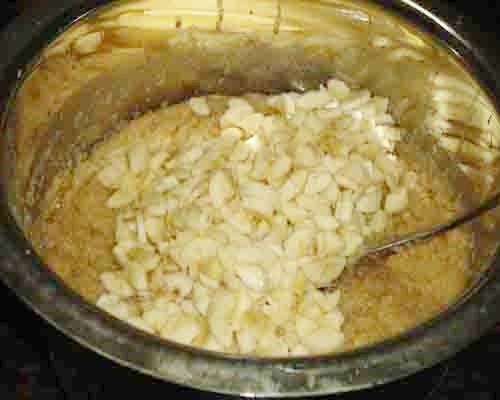 When the ghee become hot, add the rava over it and fry stirring continuously. The rava will gradually start changing colour and absorb ghee. Fry till the rava turn into golden colour. When the rava starts spreading aroma, stop frying them. Add the sugar in it and mix well. Pour milk and cook stirring continuously. Now the mixture turns into a thick paste. 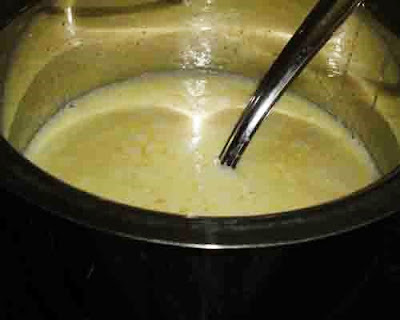 Cook this rava mixture on medium flame stirring continuously till it turns very thick. Add the chopped banana and further cook stirring continuously for 5 minutes or till the banana cooks well. Switch off the flame and cover the vessel with a lid. 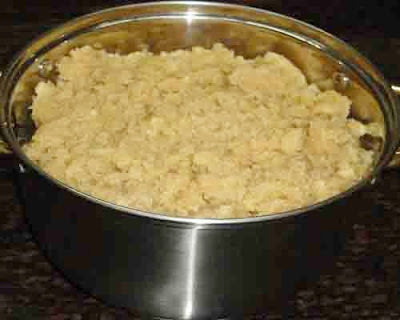 This Mahaprasad is offered as naivedya to Lord Ganesh and Lord Satyanaran during pooja. 1. Pour the ghee in a thick bottomed vessel and keep it on medium flame. 2. When the ghee become hot, add the rava over it and fry stirring continuously. 3. The rava will gradually start changing colour and absorb ghee. Fry till the rava turn into golden colour. When the rava starts spreading aroma, stop frying them. 5. 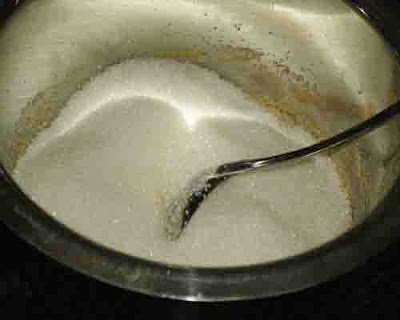 Mix the sugar well. 6. Add the milk in it. 7. 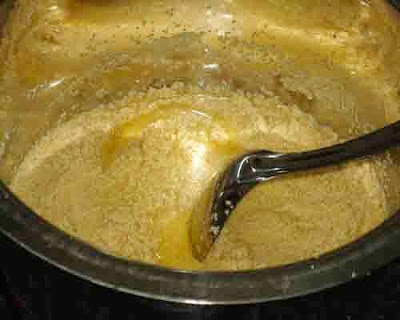 Now the mixture turns into a thick paste. Cook Stirring continuously. 8. 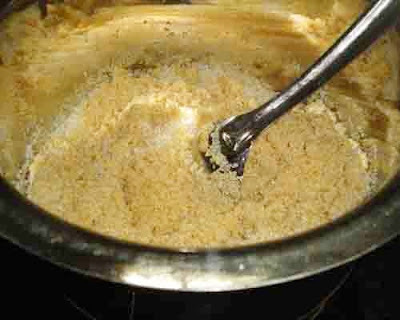 Gradually the mixture becomes thick. 9. Cook this rava mixture on medium flame stirring continuously till it turns very thick. 10. Add the chopped banana and further cook stirring continuously for 5 minutes or till the banana cooks well. 11. Switch off the flame and cover the vessel with a lid. 12. 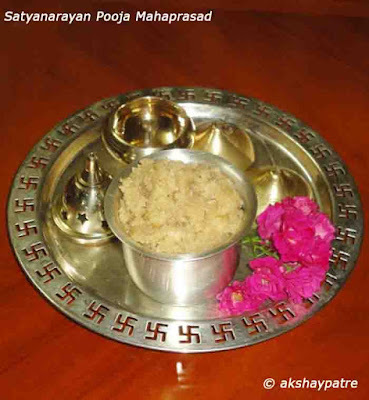 This Mahaprasad is offered as naivedya to Lord Ganesh and Lord Satyanaran during pooja. Perfectly made, well presented and sounds tasty.